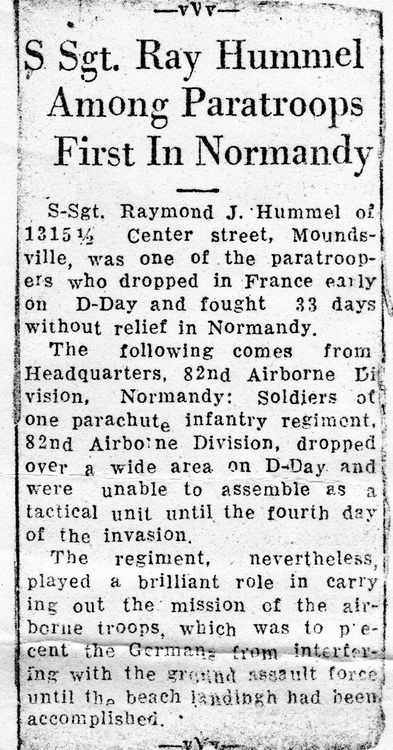 Raymond J. Hummel of 1315 1/2 Center street, Moundsville, was one of the paratroopers who dropped in France early on D-Day and fought 33 days without relief in Normandy. The following comes from Headquarters, 82nd Airborne Division, Normandy: Soldiers of one parachute infantry regiment, 82nd Airborne Division, dropped over a wide area on D-Day and were unable to assemble as a tactical unit until the fourth day o£ the invasion. The regiment, nevertheless, played a brilliant role in carrying out the mission of the air­borne troops, which was to precent [sic] the Germans from interfering with the ground assault force until the beach landindh [sic] had been accomplished.